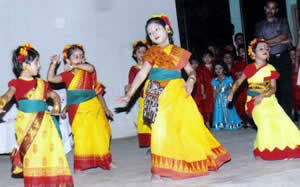 Burdwan is one of the oldest and educationally advanced towns of West Bengal. Our school, established in a humble way in 1967 in an old temple, today runs in our own building with over 500 students from grades K-IV. Because of its high standard of academic achievement and performance, well educated families send their children to our school. The present teacher-in-charge, Sukumar, is a very dedicated and creative educator who always strives to improve the quality of the teaching standard in the school. Apart from the excellent academic record, the school is successfully providing a congenial environment where children learn moral values, leadership qualities, service spirit etc. Aesthetic and cultural development is an integral part of the curriculum. 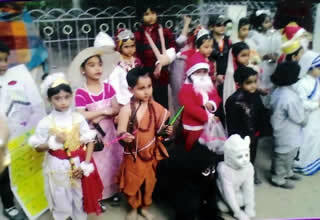 Annual sports and cultural programs always draw huge number of viewers. Students from our school always participate in the district level programs and stand out for their praiseworthy performance. 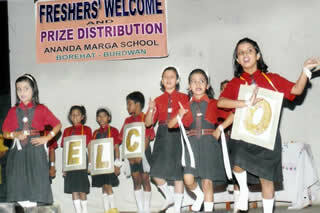 In the beginning of each academic session, teachers organize a “Freshers” Welcome Program where the new comers are given a warm welcome with cultural events. It is a very interesting and inspiring program for the students and their parents as well. A very innovative quiz competition program is organized for the parents where they learn about Neohumanism, Ananda Marga and the founder of NHE, Shrii P. R. Sarkar. Teachers and students together care for the flower garden in the court yard of the school. The teachers regularly organize nature trips and excursions for the students and the guardians, where the children get to learn a lot about mother earth and nature. Teacher-guardian relations plays an important role in development of the school here. A children’s home is attached to the school where parentless children get scope to feel a part of the school family. They get love and care of all. Our school is known in the town for the dedicated service of the teachers, their neohumanist outlook and spiritual values. Morning meditation is a special attraction for the entire school. Students graduating from our school have placed high in the society and are serving in various capacities. Dr. Shubhanshu Cakraborty, once a student of our school, is a reputed surgeon now in the locality. He sends his children to our school too. He is known for his kind-heartedness and service quality. Thus our school has been creating service minded and dedicated citizens who care for others and work for collective wellbeing. 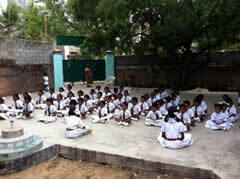 The Ananda Marga School in Chennai has about 150 children and goes up to grade 7. Didi Ananda Pradyota is the principal. (on right) Up to 7th grade – primary.